Fast acting, biodegrabable and environmentally safe, soft surface fabric cleaner effectively removes stains from fabrics while cleaning deep into material with no need to rinse off. Fast acting, biodegrabable and environmentally safe, soft surface fabric cleaner effectively removes stains from fabrics while cleaning deep into material with no need to rinse off. 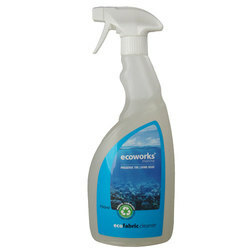 This environmentally responsible upholstery cleaner is also effective at removing protein based spils such as wine, coffee, milk, bird droppings and vomit whilst deordorising the surface too. This boat cleaner is compliant to MARPOL Annex 5 1.7.5 and is declared not harmful to the marine environment. Safe to use on most fabrics - please test for colourfastness on a small inconspicuous area first.